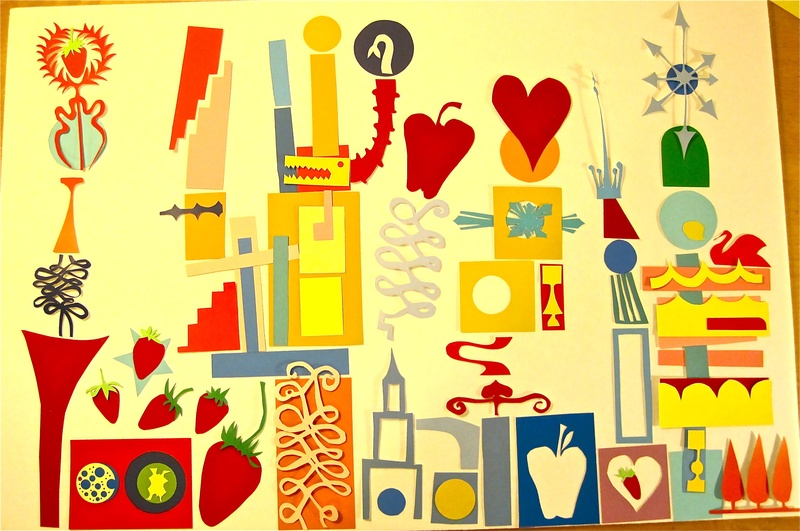 This week's challenge was a blast, as we asked participants to use paper & glue to create cake-themed collages they could then scan and turn into fabric. The winner — who also won our recent Family Crest competition — turned out to be an accomplished designer and artist named Bethany Shackelford, known to us as bzbdesigner. Be sure to check out all of the fabulous top ten! 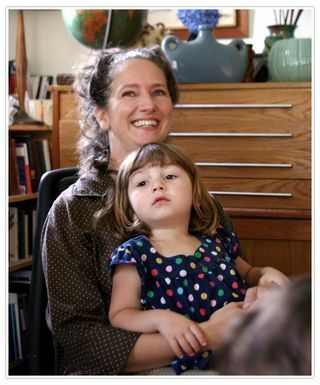 CHAPEL HILL, NORTH CAROLINA: I first met Sally Harmon back in the mid 1990's when we both worked in the kitchen of a great local restaurant called Crook's Corner. Sally worked in the salads and cold appetizer station and I did some baking and occasional cooking on the line. Sally didn't gossip and chat nearly as much as the rest of us so it seemed to me to come out of nowhere when I saw a show of her large-scale cut paper collages go up on the walls of the restaurant one week. Sally's pieces were gorgeous, complicated, Dr. Seussian collages depicting what looked like fantastical machines and structures. I loved every single one of her pieces and so, it seemed, did everyone else who saw them. They were snapped up in a hurry, little round sticky dots indicating their sold status showing up under each frame within a week or two. Fast forward about 15 years. 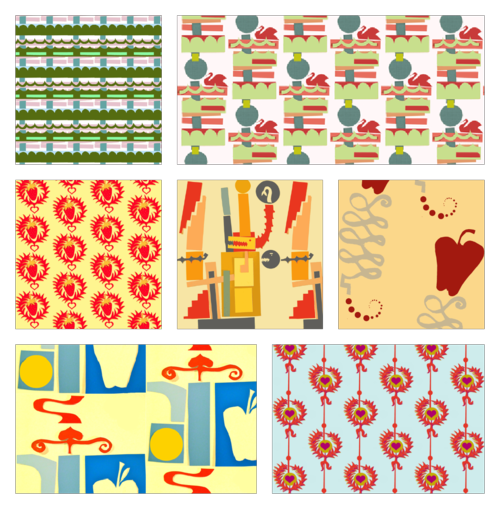 Spoonflower had been launched two years previously and I was browsing around on the site one day, checking out all the new designs that had been recently uploaded. Several designs by someone styling themselves Boris Thumbkin caught my eye. "These look like cut up paper," I thought. "Cool!" Poking around a bit more I realized I knew this designer–it was Sally Harmon! Fast forward a bit more and Sally and I have seen each other at a couple parties given by a mutual friend, our little girls have enjoyed playing together, and I've realized just how much Sally is doing on Spoonflower now. (A lot!) She talked with me over lunch recently about how she turns her physical paper collages into fabric designs, useful insight during a week when the fabric-of-the-week contest theme is "Paper Collage Cakes." Sally's approach is surprisingly low-tech and beginner friendly, and I hope you enjoy hearing about her technique as much as I did! I remember the first time I saw a show of your cut paper pieces at Crook's Corner in 1996 or so, and then I was so pleased to see your designs on Spoonflower a couple of years ago. 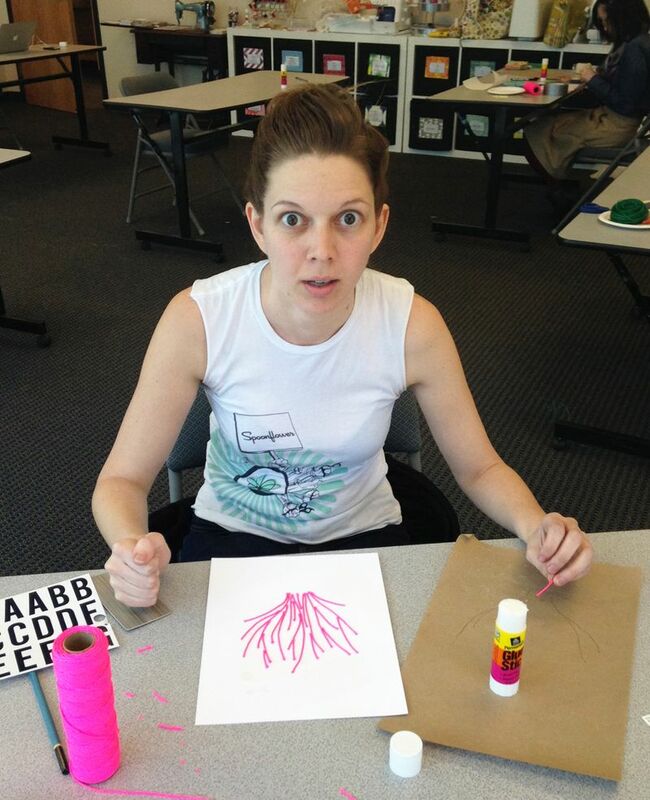 What have you been doing in the interim in terms of your creative endeavors? I like cutting paper and I’ve just done a lot of different paper cutting projects. I try to be kind of low overhead about it and not invest lots of money in fancy paper. I get a bunch of paper samples from graphic designer friends I know, and I also use manufacturer’s paint chips that I get from hardware stores. Plus I just use black cardstock for doing traditional silhouettes. I've tried but those sorts of things end up being spooky when I do them. People end up looking like monsters! Did you study art or design at all? Did you go to UNC? I did go to UNC but I actually majored in French. I took a couple of art classes. I guess your dad [professor and poet, William Harmon] was probably teaching when you were in school there, huh? Yeah, I stayed away from the English department. I got my literature requirements done and that was it. 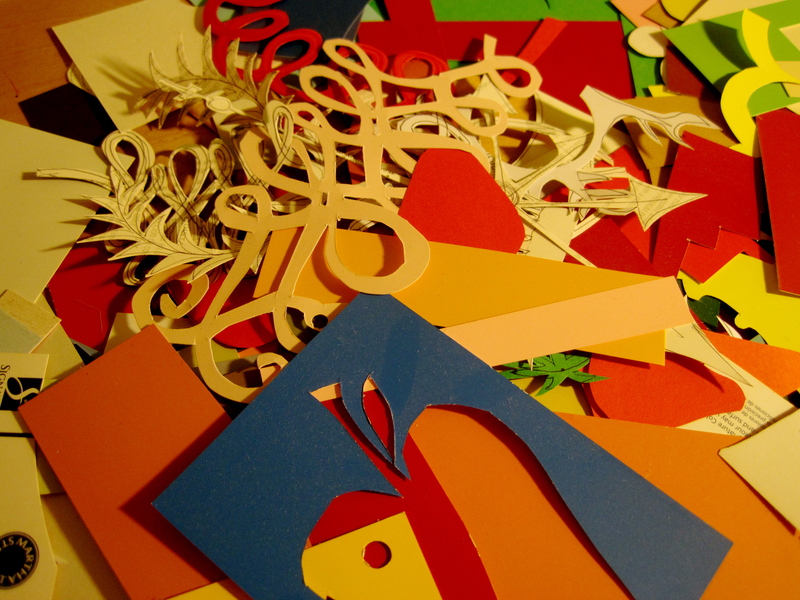 Do you currently do new paper cutting all the time? I have a bunch of things I've done in the past and photographed and gradually I’m kind of plowing through all those and finding out what can be turned into fabric designs. Unfortunately, many of them were taken with like a 1-megapixel camera and they’re teeny tiny little images. I also photograph more recent projects as I go. How do you design your collages to be turned into fabric designs? When I'm working on new designs, usually I’ll just lay shapes out the way I think they’re going to work well, take pictures, and then take some close up pictures just in case. And then if I can’t make it work as a whole, I’ll take individual components and rearrange them. But then the other thing I like doing is just throwing things all down on one piece of paper and photographing that jumble. I might move things around a tiny bit after that but not much. Like in the recipe contest awhile back, my actual submission wasn’t very good. It had individual squares of different ingredients but at the end, I sort of threw them all down and photographed that, and those designs actually ended up being stronger than my contest submission. So how do you decide what collage photos can be used as fabric designs? Do you just upload them and see if they repeat nicely? To a certain extent, now I can look at something and tell, “That’s going to look stupid.” But at first it was just throwing things up there. I’ve deleted a lot! [Laughing.] 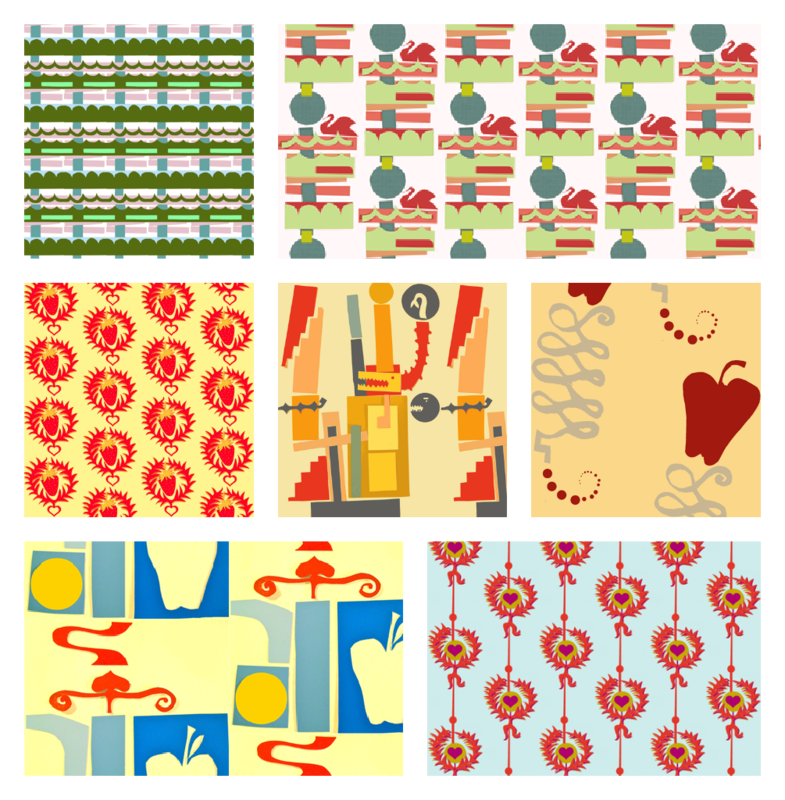 I’ve deleted a lot of stuff that was never made public on Spoonflower. 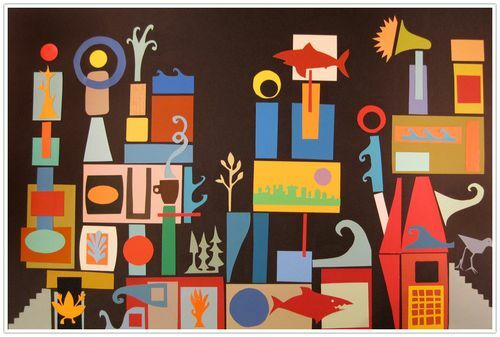 You prefer to photograph your collages rather than scanning them? I don’t like to use the scanner although I’ve tried. That's partly because our scanner is just a really old scanner that tends to fuzz out on the corners, which means that I end up cropping half of the image and messing up whatever repeat I had planned out. And also, I like a lot of times to either not glue the paper down or only glue it down lightly so that it casts a little bit of a shadow. If you smush it into a scanner, you lose that. Photo of one of Sally's large cut paper collages. So you don't want your designs to look too flat? That’s interesting. Yes, and I sometimes even light from one angle to cast shadows (with mixed effect). Then do you clean up the photos at all? Oh yeah! Usually, because I don’t have a perfect lighting setup, I run things through the Spoonflower color changer. I try to only go through once on that because it degrades things a little. I usually just do that to make the background all one color. I don’t want to lose the shadows and I want, say, all my oranges to stay orange, but I’ll just try to flatten out the background. Then I’ll take it through Picmonkey and if anything looks terrible, I’ll just put a rectangular sticker over it and move on. [Laughs.] I don’t do a lot of editing. I try to do as much editing on the paper before photographing and as little as I can after uploading. designs from the larger collage shown above. 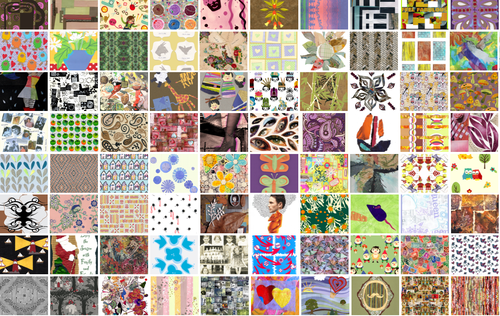 There are things that Picnik did that Picmonkey does not do [on the Spoonflower site]. Picnik had what they called a doodle feature which wasn’t very good for drawing for me but which was good for cleaning things up. 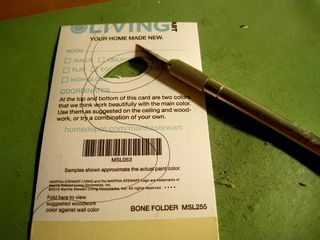 If I put a rectangular sticker over something, I could doodle along the edge to clean it up and then remove the rectangular sticker and get rid of all the smidge. But Picmonkey does have a few features that Picnik didn't have. Namely, you can make your own stickers. It’s kind of their version of the collage, or what Picnik called collage anyway. You can take whatever images you have hanging out on your desktop and stick them onto whatever else you’ve got. 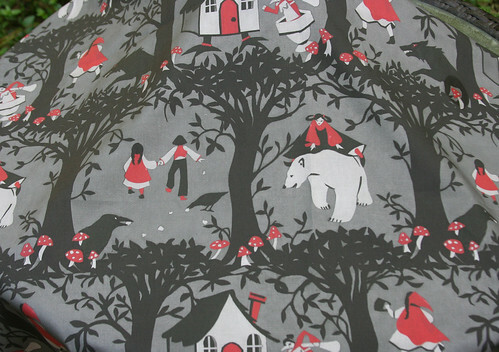 So what made you make the leap to putting designs on fabric versus just keeping them on paper? What happens to your physical collages once you’ve turned them into scanned designs? Different things. If I really like it and I think it has a chance I’ll glue it down and save it. I’d say that only happens 10% of the time. Most of the time, once a collage is photographed it’s done. Give ‘em to the kids! Then they glue them down and you know, draw on them. Do you and your kids do creative things together? My daughter Carmen likes to go to the hardware store to get paint chips and then cut them and glue them down. Does she have colors she really likes yet? She used to like pink but now pink is so last year. I wouldn’t mind if my girls got sick of pink. Well, she tells me this after we’d painted her room pink. Oh, that's a drag. What did you do when you were a kid? Did you grow up in a creative household where people were doing craft projects all the time? Well, I took a lot of music classes when I was a kid. And I drew and stuff like that. That’s funny. I've that reaction to the walls of colors but never actually did anything with them like you have. So you cut all your shapes out of paint chips? How long do the collages last if you keep them? Well, that’s the funny thing. For a long time, I assumed that the paint chips were going to be the first thing to go, to perish. And so I would get acid-free glue and acid-free board and put all those cut paint chip shapes down and glue them and now…I don’t know, 15 years later, the paint chips seem to be holding up fine. It’s the glue and the board that are not doing so well sometimes. The glue is actually what goes first. The paint chips, I mean, they're lithography ink printed on card stock. 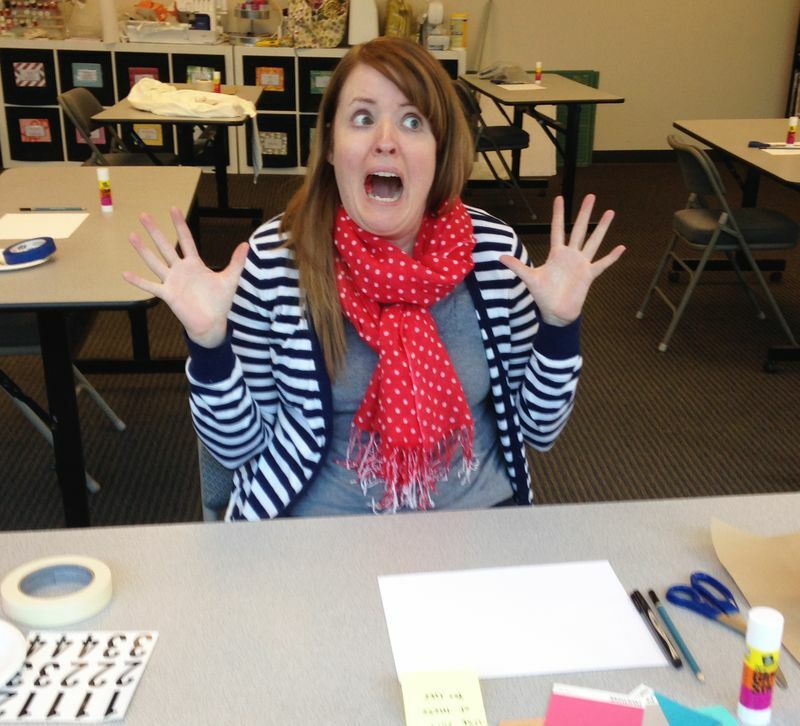 Do you get samples of your designs printed and then do your kids like them? Well, Carmen has done a few designs herself but she's more process oriented at her age than results oriented. But I did let her enter one of the contests once and she was really into that. She wanted to check on her contest entry all the time. She’s competitive. She got more votes than me for that particular contest and hasn’t let me forget it! Funny. So one more thing. Where did the name "Boris Thumbkin" come from? Well, my name, Sally Harmon, is taken. (She's a new-age pianist.) Same with my married name, Sally Palao. (She's my stepmother-in-law, the business manager of a New York theater.) So I needed to come up with something completely different. I took Russian in college and do some Russian-influenced work (like Yellow Samovars and Samovars on Black). Thus,"Boris." I also have half-realized plans to do a "Porridge Cupboard" of nursery rhyme images, ergo "Thumbkin." In this week's challenge we asked designers to use paper and glue to create cake collages that they could then scan and turn into fabric designs. As is often the case, the more difficult the challenge, the more breathtaking the creativity. Vote for all your favorites in this week's contest and we'll announce the winner (and top 10) on Thursday morning. Congratulations to Cean Irminger! By winning her fourth (shoes, snow, apron) Fabric Of the Week contest with The Black Forest, she is now officially tied with SammyK as all-time champ. Following in the talented footsteps of SammyK, who donated her fourth win prize to Kindred Spirits Animal Sanctuary in New Mexico, Cean has requested that in lieu of receiving $100 in free fabric we make a donation on her behalf to Heifer.org, a great organization that provides livestock, training and services to small farmers and communities around the world. We are very pleased to have been able to purchase a sheep for Cean. Thank you, Cean! Upcoming Fabric Of the Week Contest themes appear below, along with the deadline for submitting an entry. Full instructions for submitting designs, along with rules and information about prizes, appear on our upcoming contest page. be previewed for voting at a fat quarter size (21" x 18"). Deadline is Tuesday, July 20, 2010.